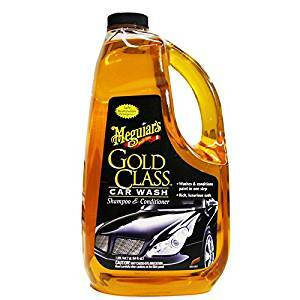 Getting best car washing soap is difficult, because mostly all soaps are considered as same. Biggest mistake we make is not realizing that there are soaps specifically designed for car. No doubt, most people think that regular dish washing soaps are ok for car also. However, they damage the paint and protective layer on the paint and allow dirt and debris to penetrate and damage the paint. It is ok for an old car with worn out old paint, however to car’s polish or wax new and paint looking nice and sharp, you must look into soap specially designed for cars. Usually you must wash your car once in a week if you drive it daily. With so many brands out there it is a difficult to choose from especially when all look same. We personally checked most of the brands and here are the reviews of 3 best car wash soaps for you. 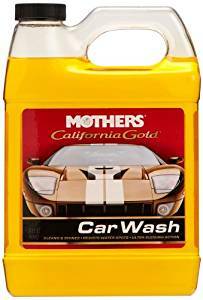 Mothers California Gold is best for those who are looking for strong cleaner that doesn’t dull car paint. 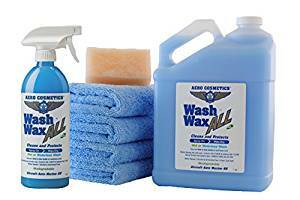 We recommend to keep car wash soap and wax separate, because the combo solutions are usually junk and ineffective. Mothers California packs a strong punch as separate car wash soap along with super sudsy solution. It is wisely pH balanced therefore it doesn’t react with car paint or the wax and soaks up bacteria and dirt like none other. The best thing about it is its ability to wash debris while protecting wax. Other car wash soaps either wash away wax or leave some of the dirt and water spots. Moreover Mothers California goes longer, as you usually dilute it in water with 100:1 ratio that means usually 2 – 3 oz. is enough for washing whole car. It really works well on black color and even enhances black paint. 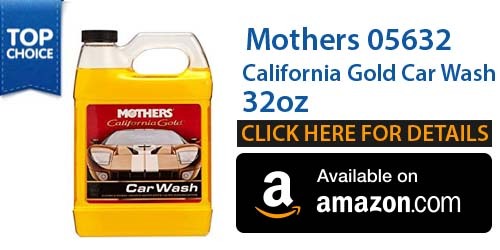 Overall, Mother California Gold is the best car wash soap for those looking for a simple yet powerful, and nonreactive car wash soap. Optimum is the best no rinse car wash solution. This is completely a game changer. If you have washed car in traditional way, you will be aware how hard it is to rinse off soap and ensure you do not get any water marks behind. Optimum No Rinse is innovative solution which contains extremely lubricating polymers which waxes and releases the dirt and debris as well. The best part is that all this can be done without the help of hose. Just mix 1 oz. of Optimum in 2 gallons water and with a microfiber towel absorb all the dirt and debris and another microfiber towel for drying off water and it’s done. There isn’t any need of a hose to rinse off excess soap, dirt and debris. It can be use anywhere with a little bit of water. You don’t need a connected water supply. Optimum gives a faster cleaning results without any hassle. It is not only a car wash but also serve as a wax. As it isn’t recommended to apply combination, Optimum packs a strong shine alone. Optimum is best for high end cars, professional car detailers and for those who need convenient means to wash their cars without any water supply. 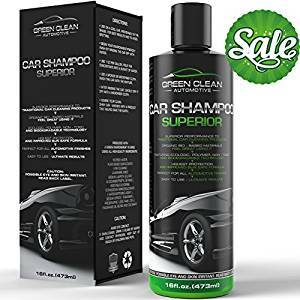 Green Clean is the best environmentally friendly car wash shampoo which is made from high quality natural bio based ingredients like vegetable glycerin and plant extracts. It is free from harsh chemicals like alcohols or VOCs. Its bottle and caps are also completely recyclable. 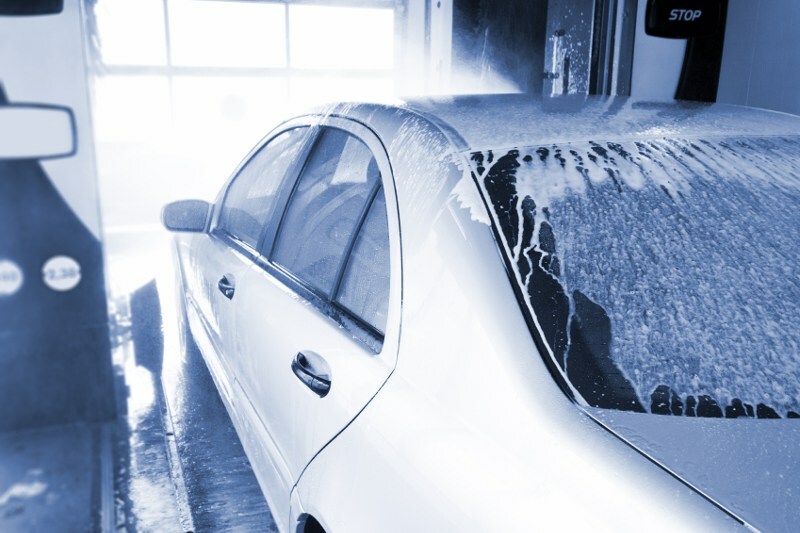 As other soaps goes on cheap with dirty ingredients, you can be sure enough that Green Clean uses premium ingredients which doesn’t strip your car wax, polish or paint and it is completely safe from sun’s ultra violet rays. One bottle of Green Clean last for years, it works better than most if not all brands when it is about cleaning power and ability to eliminate nasty water spots. 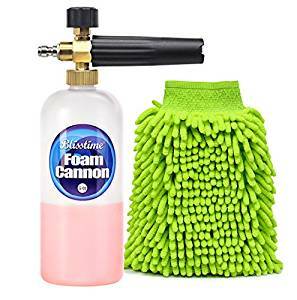 Applying it is also quite simple, just mix it with water, wash car with microfiber towel or sponge and rinse it off with water and then dry with microfiber towel. Also use Green Clean Wax after this to protect the paint and shine of your car. 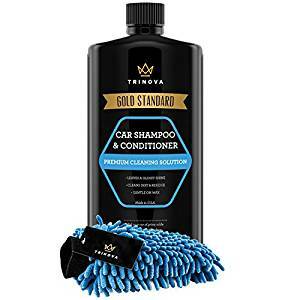 Overall, Green Clean Automotive Car Shampoo is best car soap that is environment friendly and provide a superior performance at slightly premium price. Chemical Guys car wash soap is the best suds all-purpose foaming shampoo that removes dirt and grim without stripping sealants and wax. It is very simple and easy to use and you can use t in and out of sun. You can formulate it with water softeners in order to reduce streaking. I never leave any water spot behind. It is a complete state-of-the-art solution which is extremely quick, effective and at the same time gentle and natural. 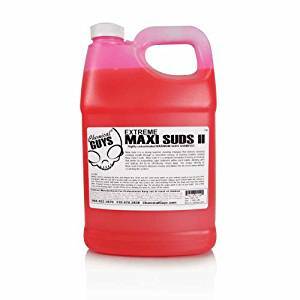 Maxi Suds II is best car cleaning soap which delivers best results through continuous release of foaming bubbles. Its advanced foaming formula draw, debris, dirt and road filth off your car exterior and leave a clean and smooth surface behind. It is engineered to give the largest amount of suds in one bucket. Only 1 ounce of soap in 4 to 5 gallons water can produce wash solution which will impress any professional or weekend enthusiast. It is uniquely formulated with new foaming technology which works by suspending best polymers with all bubble, allowing built up dirt and grime to effortlessly and easily rinsed off without any need of scratching surface. It also prevents the hard water spots and deposits. It washes entirely clean leaving a spotless, luminous surface behind. It creates long lasting, aromatic and long lasting bubbles even in calcium enrich or hard water. This means that it cut through heavy grime, dirt and road film, as well as works to avoid water spots. It has a water softening mechanism which reduces unwanted and streaking blemishes by water. It offers the great versatility that gives you the advantage in all detailing situation. It is a perfect shampoo wash that handle all detailing tasks. Its pH balanced formula is great to work on color paintwork as well as it is great on wheels and plastic. You can use it in weekly 2 bucket wash to get a streak free shine which is really impressive. 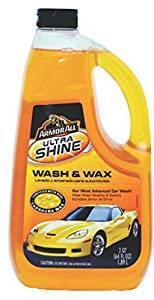 Griot’s Garage 10866 Brilliant Finish Car Wash – 64 oz. 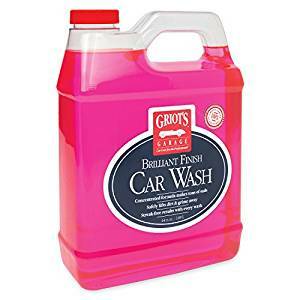 Griot’s Garage Is a concentrated formula high viscosity car wash soap that gives brilliant finish for 1 ounce per gallon of water. Yes this is what you just need to get rich and slippery suds. It has ultrahigh suds to give you more lubrication. It is bio gradable and has a pleasant scent, therefore it is safe for you and your car as well. Its high lubricity of suds makes it easier and safer to use as compared with competition. Griot’s Garage 10866 Brilliant Finish Car Wash is specially designed with a pH balanced formula to allow you to safely lift grime, dirt and debris, without stripping any paint or wax or sealants. It leave a streak free shine behind. Its special brighteners leave brilliant finish. Moreover you can refine and maintain this finish by using Girot’s Garage polishes, sealants and waxes. It comes with 100 percent satisfaction guarantee for lifetime.